For those who don’t know the past, don’t get the wrong idea: during the NWOBHM uprising against many musical trends in those days, Metal was rising in many parts of the world, not only on the UK. Brazil, USA, Netherlands, Belgium, Germany… All of those countries had their pioneers as well. 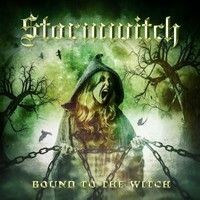 And although many don’t know, STORMWITCH’s name is a legend, and their latest release, “Bound to the Witch”, is here to proove how this witch still has to say. By the grace of the witch, the play a form of traditional Heavy Metal that don’t seems like NWOBHM or is related to German Heavy Metal format. It’s a hybrid of many influences, with very good melodies and charming choruses, without technical exaggerations. It’s just Heavy Metal, in its purest and great form, and how it sounds good in their hands. This album can show you all the difference from those of the Old School from those wannabes who emulate the old sound. This is their 11th album, and it was produced by the band itself along with Marc Ayerle (who did the mixing and the mastering as well). The sound quality is really excellent as their music demands, clear and heavy, and with the right amount of aggressiveness. All was conceived to keep their musical work clear, heavy and melodic. And what a wonderful cover that was created by Michael Vetter. All the 11 songs are really great, without bringing anything new. And “Songs of Steel” (what lovely melodic lines, with the right dose of weight and charming chorus), “Odin’s Ravens” (excellent melodies and heavy tempos), the Hard’n’Roll essence of “Bound to the Witch”, the grasping melodic lines from “Arya” and “Stormwitch” (both with excellent guitar riffs), the pure 80s energy unleashed on “Ancient Times”, and the oppressive heavy insight of “The Ghost of Mansfield Park” can be named as their finest moments. But the new versions for three old classics (“Stronger Than Heaven”, “Rats in the Attic” and “Priest of Evil”) is proof that this witch is here to stay, and to deliver its spells on each one who hear their songs. Listen to “Bound to the Witch” and let yourself be seduced by this German Metal witch!